LOL. 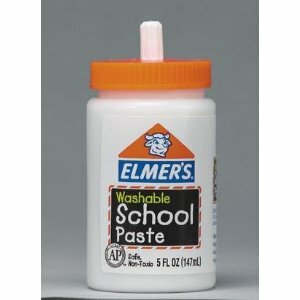 Back in the day when I was in elementary school in the 60's, I ate my share of paste. As a previous poster said, it did indeed tasted like some kind of mint flavoring. Now, I don't know if that was intentional, but it was really tasty. I wonder if the stuff is still produced. Maybe a whole new generation is getting hooked on it. This brings back memories...in Grade 2, 1970/71, snacking on glue and crush on my teacher...now what was her name..? lol. I ate my share LOL. All right, I cop to it. I also ate the paste. It tasted like peppermint. OK Duff...here is the best answer that I can give. In 1st thru 4th grade there were times that we made things with construction paper and paste. One big project was to cut strips of the heavy colored paper, and paste them together to form rings. You interlock the rings to form a chain. If the paper was red and green this was a great Christmas decoration. I told you all of this to tell you that the white paste came in a gallon jar. The teacher would give you a large "glop" of it on a paper towel so you could take it to your work table. You applied the paste with your finger onto the paper rings. I guess we were curious (the boys anyway). It tasted like mint...hmm...not too bad !!! So thats how it worked..a little on the paper...a little in the mouth......minty !!! I never did this, but I gather that a lot of kids did. If you're among them, what drew you to this? Where did it lead?